In anticipation of the Risk/Reward Festival, we’re presenting daily profiles of the artists involved. Last profile: OSLUND + CO (Performing in the 5pm showcase). Risk/Reward is here, and what better way to kick things off than to post our last profile, of the esteemed Oslund + Co? If you’re a Portlander, you likely are familiar with this force of nature in Portland and beyond. As a choreographer, teacher and performer, Oslund is regarded as one of the Pacific Northwest’s leading dance artists. Throughout her career, she has advanced the discipline of contemporary dance through the exploration and creation of new work annually. Her work has been supported by the National Endowment for the Arts, The Oregon Arts Commission, the New York Foundation for Contemporary Performance Arts, the National Dance Project, and the Regional Arts & Culture Council. She co-founded and now co-directs Conduit Dance with Tere Mathern which has provided a home base for Oslund Co/Dance. You can read articles on Mary Oslund’s performance here and here. You can watch clips of other Oslund Company/Dance performances here and here. 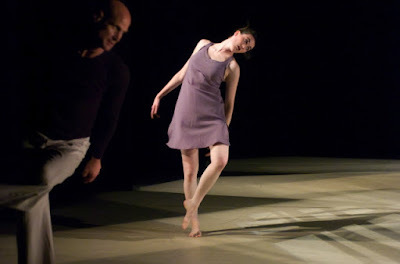 In January 2011 her new piece, Childhood Star, will be featured by White Bird in their 2010-11 season. For Risk/Reward, Oslund + Co will present Flora, a reworking of Anatomica (2010) and Fauna (2010) for three dancers, and Hand2Mouth is incredibly honored to present this work in the festival this year. We’ll see you at Risk/Reward!